Have you seen the new EA-ZY ADZ in the latest issue of Soar Valley Life? The all new Business Directory section has been introduced to provide a simple, affordable way to promote any business to the people living in the Soar Valley of Leicestershire. There is just one size and style of advert which effectively states who you are, what your business does and how to get in touch with you. 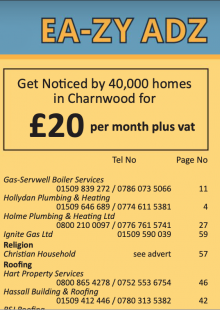 The adverts cost only £20 (plus VAT) per month, which is the equivalent of £1 per 1000 households. We believe this to be the lowest priced advertising per letterbox in Leicestershire. If you’d like to sign-up visit our page for Advertisers or give Steve a call on 01509 813125. Tags: Advertising and EA-ZY ADZ.